(HARLINGEN) – Monica Sanchez hammered, nailed and stained her very own wooden toolbox and planter during Texas State Technical College’s third annual Diversity in Science, Technology, Engineering and Math (STEM) Day. Sanchez got a firsthand look into TSTC’s Building Construction Technology and Heating, Ventilation and Air Conditioning (HVAC) Technology programs. 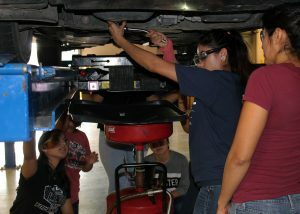 She was among 63 high school students from across the Rio Grande Valley who participated in the event that is focused on encouraging girls and women to pursue male-dominated careers and vice versa. The event, which was hosted by TSTC’s Enrollment Management, Support Services and Student Recruitment departments, included information booths on admissions, financial aid and other student services. Attendees heard from keynote speaker Stacey Perales, a TSTC Architectural Design and Engineering Graphics Technology lab assistant, and Marty Capetillo, a TSTC Dental Hygiene student. Program tours were offered in Architectural Design and Engineering Graphics, Agricultural Technology, Automotive Technology, Building Construction Technology, Chemical Technology, HVAC Technology and Precision Machining Technology. TSTC enrollment coach Anna Cortez said Diversity in STEM Day is about exposing both girls and boys to nontraditional careers. Each program tour was approximately one hour and included hands-on activities such as building toolboxes and planters, creating dice using machine shop equipment, and changing a tire and the oil of a car. 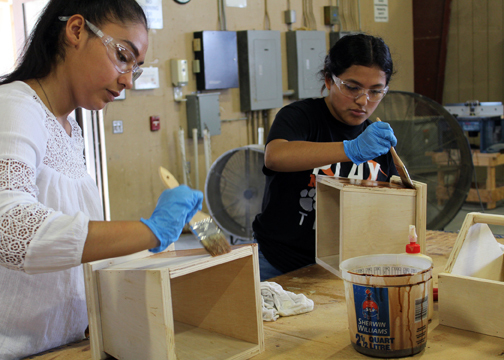 Weslaco East High School junior Mia Ramos made a pair of dice while touring Precision Machining Technology. She said she has always been interested in designing and would consider either machining or architectural design as a career. The 16-year-old said that although she has a dream of graduating as a Texas Longhorn, she will begin her college career at TSTC to get a head start and gain experience in either architecture or machining. Cortez said overall the event was successful and it was great watching students excitedly share their experiences with one another. She also said she hopes the program continues to grow and the collaboration between departments, programs and school districts remains strong. Spring registration for new students begins Nov. 12. There will be a Registration Rally, a one-stop registration event, on Tuesday, Nov. 13, from 10 a.m. to 7 p.m.
For more information on the programs offered at TSTC or to apply, visit tstc.edu.